Our meticulous attention to detail results in a quality Reproduction Set of Pull Knobs for the Mills Candy Machine Vendor. We have seen two versions of the Mills Candy Machine Pull Knobs, Plastic and Aluminum. 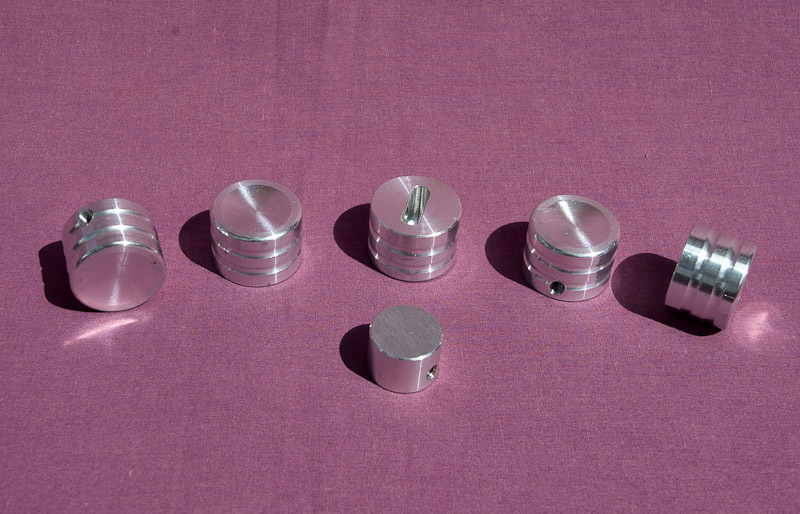 Due to the versatility of being able to paint, powder-coat or chrome plate aluminum, we manufacture our Pull Knob Sets from high-grade aircraft aluminum. Sold in Sets of 5 Vend Knobs w/ 1 Coin Return Knob (both include set screws) - Approx. Dimensions: Vend Pull Knob: 1" Dia. by 3/4" deep; Coin Return Knob: 3/4" Dia. by 1/2" deep.